A crucial factor when planning a trip is to ensure the availability of all necessary ground support equipment at your destination. This is especially important when operating to remote locations. In this article, we will explore some of the key points to consider before you fly. Is the correct type of fuel available? Before flying, it is always recommended to confirm what types of fuel are available at your destination. Additionally, the delivery method needs to be taken into account. Fuel hydrants are not always available, and if fuel is to be delivered by truck it may be necessary to make arrangements in advance. This is especially true if the fuel needs to be brought in from outside the airport. Organizing this can lead to additional costs, and a longer time spent on the ground. Fuel quality may also present challenges, with contamination a possibility at more remote locations, where fuel may sometimes need to be pumped from a barrel. For peace of mind, you should always work with a trusted provider. All of Jetex’s fuel providers are subject to a stringent auditing process, ensuring only the highest quality fuel is delivered at all times. Do you need aircraft stairs? Large and wide-body aircraft may require external stairs in order for passengers and crew to board or alight. If your aircraft requires stairs, it is important to ensure the destination airport has the correct equipment available. It may be necessary to make special arrangements, which can result in extra expenses or delays. Is any baggage handling equipment required? Larger classes of aircraft may require specific baggage handling equipment, in the form of belt loaders and lifts. For airports with high volumes of commercial airliner activity, availability of this equipment may be limited. Always be sure to check in advance if you will be arriving during during peak hours. At many airports, it is mandatory to carry a towbar on board the plane. If this cannot be provided, then parking will not be confirmed. Bear in mind that local FBO operators may not have the correct type of tow bar available for your plane, especially for less common types of aircraft. Before flying, it is highly recommended to confirm whether you need to bring your own towbar head, or even the full towbar. Does the airport provide ground power units (GPU)? In some destinations, restrictions are in place on the use of auxiliary power units (APU). It may be that your APU can only be used during specific times of day. For particularly noise-sensitive airports, it is often only permitted to use APU for a few minutes before and after landing. As a result, it is important to check on the availability of GPU at your destination, especially if your aircraft will be on the ground for a long time. Be prepared for the fact that oxygen may not always be available at your destination airport. Some countries have tight restrictions in place governing the storage and distribution of pressurized gases, and in more rural locations the ground handlers may lack the necessary facilities. When it comes to the replenishment of on-board oxygen, you also need to ensure that the supplier is approved to service your particular aircraft type. For certain destinations, regulations apply which require all inbound aircraft cabins to be treated with an insecticide spray before landing. These include India, Australia, some Caribbean countries and parts of Africa. It can prove tricky to obtain the necessary sprays in some locations, due to local restrictions on the chemical ingredients. If disinsection is required for your flight you are strongly advised to source and obtain your supply of insecticide spray in advance. When flying in colder climates, it is important to check on the availability of the correct type of deicing fluid for your aircraft. Be aware that the quality of local brands can vary, and in certain destinations fluids have been found to be corrosive to aircraft paint. Be sure to investigate the local procedures at your airport of arrival, in order to avoid any unnecessary delays during peak periods. There are various smaller pieces of equipment which may be specific to your aircraft, such as ladders to access the engines, specialist tools and cleaning equipment. It pays to be mindful that the correct items might not always be available at your destination airport. Even simple wheel chocks can occasionally be in short supply during local event periods. As outlined above, it is highly recommended to ensure all equipment requirements are checked in advance. This is especially true when operating to remote destinations or airfields with less frequent general aviation (GA) traffic, where some of the equipment needed may not be available on-site. In such cases, it is advisable to allow two weeks lead time to make all the necessary arrangements. 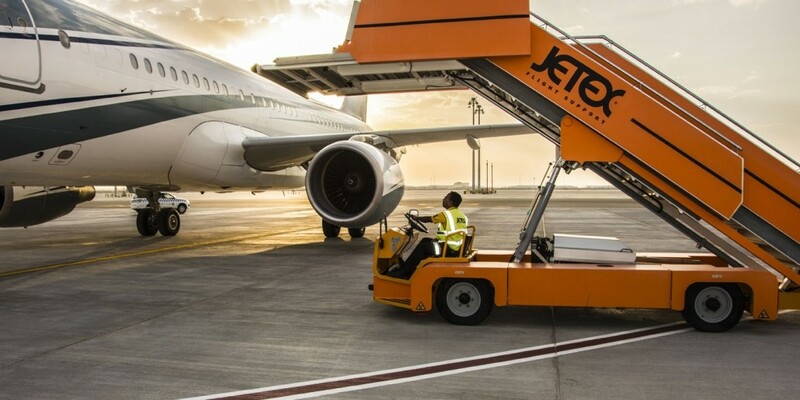 The Jetex team has vast experience in global trip planning, and will be happy to guide you in case of any questions relating to equipment at your next destination. For expert advice, contact us today on +971 4 212 4000 or email info@jetex.com.